Shirley Boone, the wife of legendary entertainer Pat Boone, died Friday morning. She was 84. People magazine reports she passed away at the Boones' home in Beverly Hills, California. She had been suffering from vasculitis for less than a year. 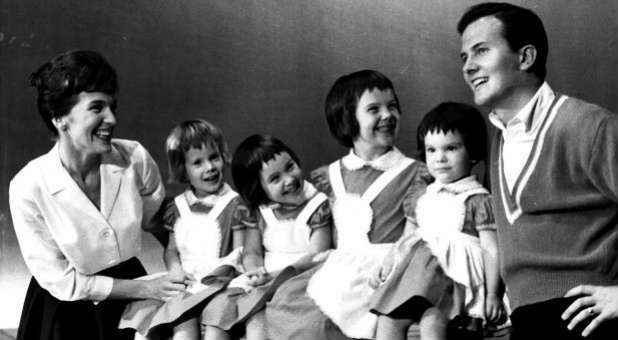 As she passed from this life to the next, Shirley was surrounded by her husband and their four daughters, Cherry, Lindy, Debby and Laury, who were by her bedside singing hymns to her, according to the magazine. "We lived a wonderful, blessed life together for 65 years. I've parted with my better half for a little while ... but we don't die, we just move on to another place, and today was moving day," Pat said of his high school sweetheart. "She's changed her address is all and moved to a different mansion that I expect to join her in one day."